Parents think their children will be happier and healthier in the future as adults, but also less well off, according to a new report commissioned by insurance company Haven Life. Only one in eight Americans believe that their children will be better off financially, when compared to their parents. 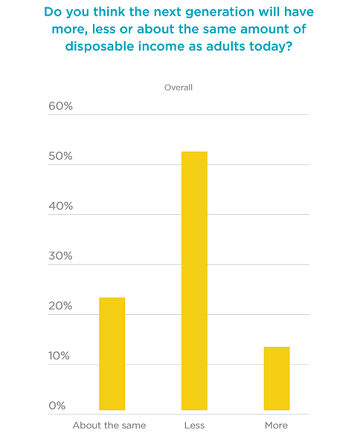 More than half of American parents believe their children will have less disposable income in the future, and only one in five Americans believe their children will enjoy greater quality of life. On the other hand, more than 60 percent of adults believe that future generations will lead “as healthy or healthier” lifestyles than adults today. And half of them think their children will grow up to be more environmentally conscious adults who lead greener lifestyles. More than half believe that this future generation will be more ethnically and racially diverse. The study was done by YouGov for the Haven Life Insurance Agency. YouGov conducted an online poll with a representative sample of 1,124 U.S. adults in the first quarter of 2015.